Are you ready to join a book club? Now's your opportunity! Rae-Bon Sew & Quilt Shop is starting a book club, but instead of just reading a book, you'll be making a new project! Each month we'll select a new book and you'll have the month to select and sew up one project from the book. This cosmetic pouch will get you comfortable with using some of the specialty stitches on your 8 thread Baby Lock serger. We will guide you in using the coverstitch as a decorative stitch as will as using the 3/4" belt loop binder. The wave stitch will be used to install a zipper using the cording foot. This project will build your confidence in using your serger and be fun to use. Bring your own machine. A supply list will be available upon registration. If you do not have a belt loop binder or cording foot, you can try ours before you buy. 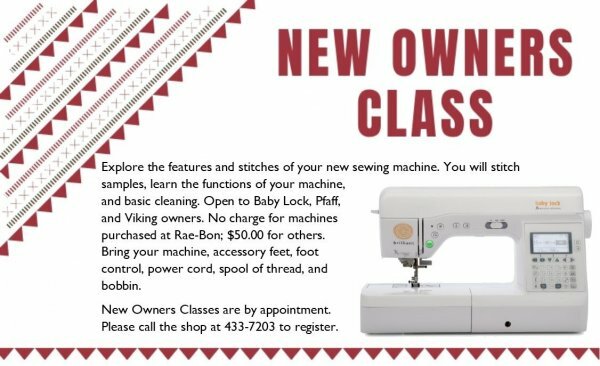 Over the course of three classes, Suzanne Spiese's will help you create the prefect fit when sewing a garment. Each student can select a pattern from the selection of garment patterns in the shop. 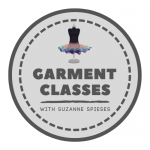 Build your confidence in garment sewing while you can construct an expertly fitted garment! 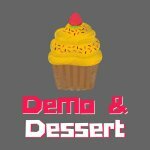 We'll provide a tasty dessert while you learn about new products, machines, or fabrics that have arrived in the past month. Receive a 10% discount on any new items highlighted that day.